Charles Dimmick, violin, enjoys a varied and distinguished career as concertmaster, soloist, chamber musician, and teacher. Praised by The Boston Globe for his "cool clarity of expression," he has been concertmaster of the Boston Modern Orchestra Project since 2006; Elliott Schwartz's Chamber Concerto VI: Mr. Jefferson marks Mr. Dimmick's debut performance and recording as soloist with the ensemble. In addition to his leadership role in BMOP, Mr. Dimmick is Concertmaster of the Portland Symphony Orchestra and Assistant Concertmaster of the Rhode Island Philharmonic. Sought after as an orchestral musician, he also performs with the Boston Pops, Boston Lyric Opera, Opera Boston, and Chamber Orchestra of Boston. 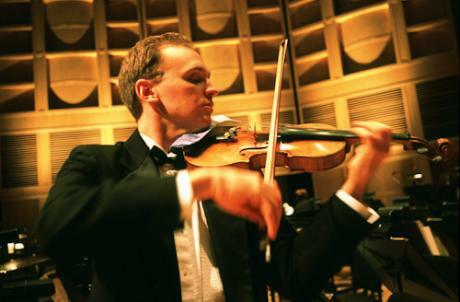 He began his violin studies at age 5, and his professional life at 15 with the Springfield Symphony Orchestra. At 19 he became the Assistant Concertmaster of the Dayton Philharmonic. As a soloist, Mr. Dimmick has garnered praise, packed houses, and received standing ovations for what the Portland Press Herald has called his "luxurious and stellar performances" and his "technical and artistic virtuosity." Recent concerto engagements have included performances with the Portland Symphony, BMOP, North Shore Philharmonic, and the Portland Chamber Orchestra. Mr. Dimmick is a member of the recently formed Mt. Auburn String Quartet and collaborates with the Sebago-Long Lake Music Festival, Monadnock Chamber Music Festival, and Chameleon Arts Ensemble. Former Assistant Professor of Violin at the University of Southern Maine, he maintains a select private studio. His primary teachers include Joseph Silverstein, Peter Oundjian, Victor Romanul, and Stacey Woolley. Mr. Dimmick attended University of Cincinnati's College-Conservatory of Music and received additional training at the Tanglewood Music Festival and the Verbier Festival. He has performed under the direction of Gil Rose, James Levine, Yuri Temirkanov, Zubin Mehta, Claudio Abbado, Seiji Ozawa, Wolfgang Sawallisch, Larry Rachleff, and Robert Moody.